It’s been a while since Bayou Fountain has had a chance to drop all the way down to its lowest levels, but with rain finally tapering off of late, low water has returned. Finally, we could get to some of the surprises we’ve known were waiting. 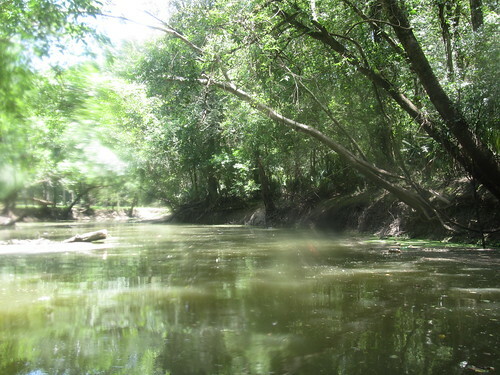 Bayou Fountain is always a great paddle, and when the water is very low, parts of it become interesting. If you’re paddling downstream (left) from the launch at the park, you may encounter a little shallow spot to weave through right at the Mile 4 marker (just before the first bend), but after that, there’s plenty of water all the way to the Not-So-Great Wall Of Fountain two miles down. 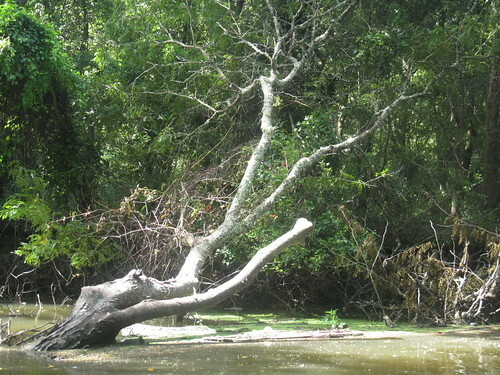 After the Wall, with the second powerline crossing, there can be more shallows with embedded logs, depending on how high the water is in Bayou Manchac. 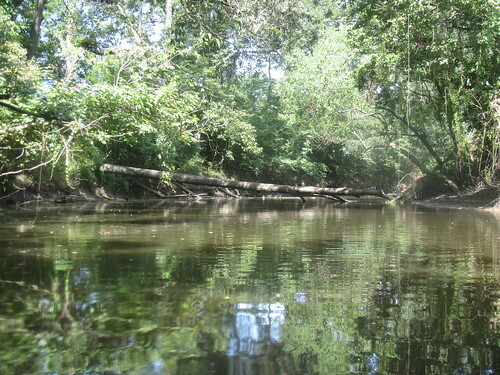 It adds some fun to the paddle, as you may take the wrong side here and there and have to try again if you run up on something that you would never, ever know about at normal water levels. We did spend a good bit of time this trip pulling some of the sinker logs moving them out of the way so there will be clear paddling even at dead-low water, just in case. Of course, with the water low, the two trees we noted last time were ready and waiting for their turn to be polished off. We had to leave them unfinished last trip, as I wore Mike completely out and had to return him to the park for charging. This time, however, I was solo, so there was nothing to call an early (as it were) end to the mission. The first of the pair was a locust tree of one type or another. Their wood is very hard but also brittle, so while it doesn’t cut easily, well-planned cuts end with a very satisfying snap and big splash. 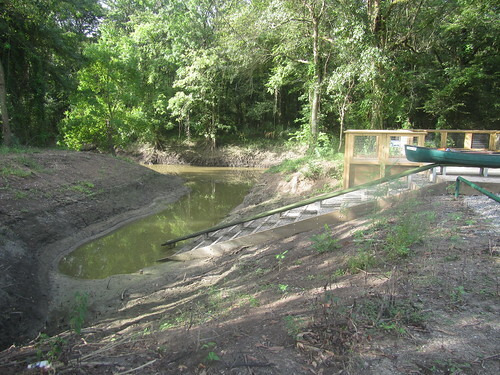 I kept the cut pieces large and pulled them over to nestle with another non-obstructing fallen tree, where they can serve their new purpose as fish habitat. If the water gets to dead-low levels, we may take a chunk off the trunk, too, but there was plenty of passing lane for now (and it was not a cool January day out there). And then it was on to the next tree. As it was not a locust tree, it was much faster to slice up with a handsaw. It was a bit fun, as every time you thought you reached the final cut, you discovered another fork just below that. I’d say it was easier than the locust tree, but on the other hand, it didn’t have the aromatic almost legumey smell that the locust tree gave off as you cut. I suppose that may have been best, as it’d be a shame to get hungry with the day just hitting its stride. With Bayou Fountain all clear, normally it would be time to head back to the launch to load up and head home for some well-deserved relaxation. Alas, that was not the plan for this trip. Before hitting Bayou Fountain, I had stopped by Manchac Park to fly a quick aerial recon of a tree Rachel and I had encountered across Bayou Manchac. It was indeed still there, and with the water so low, we’d be able to do a “quick” minor fix. 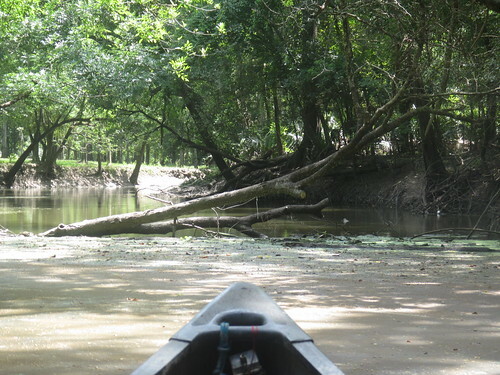 So, instead of turning back at Manchac, I kept paddling until I arrived at the big tree, seven miles from the launch. Someone had actually gone at it with a chainsaw and made a couple shallow slot cuts in it, but it was basically unchanged from when we saw it earlier. It’s far too thick to handle with an 18-inch handsaw, but we didn’t have to deal with the whole thing. All we had to do was cut through the three or four big limbs sticking up from the crown as it lies. 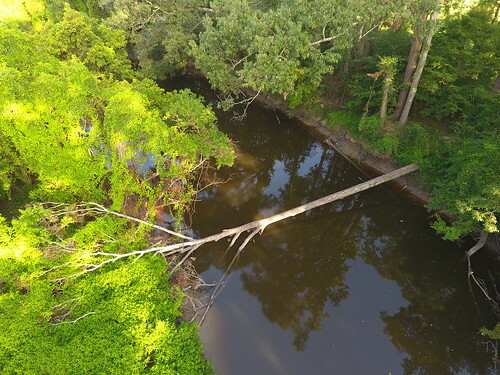 That has no effect at all on how the rest of the tree sits, but now paddlers now have two overlapping options: when the water’s low, paddle under toward the left (north) side, and when the water’s high, slip through the gap on the right (south) side. With a paddler’s path now secured past the fallen tree, it was time to head back to the launch, picking up a few small jobs (and working one treeberg) along the way. Two gallons of Powerade and 12 hours after the day began, we left the park behind as dusk fell, knowing the the bayou was in fine condition. Now, if we could have just enough rain to keep the bayou at a pleasantly middling level, everything would be perfect. I stumbled upon your site by accident and I am glad I did. 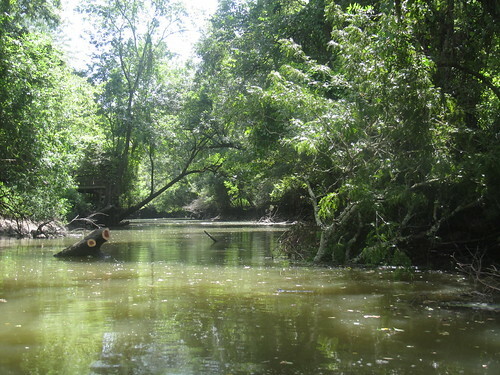 I live on Bayou Teche in St. Landry Parish and love to see people giving some pub to paddling in Louisiana. Great job.